Each tree has its own theme. NBC 7's Steven Luke reports. When it comes to Christmas decorations, one Alpine, California, resident's philosophy is simple: The more the merrier. Fifteen years ago, Rhonda Lamar began collecting holiday decorations. Her seasonal stockpile grows more extensive each year, from festive figurines, garlands and trimmings to her prized possessions: 23 Christmas trees. 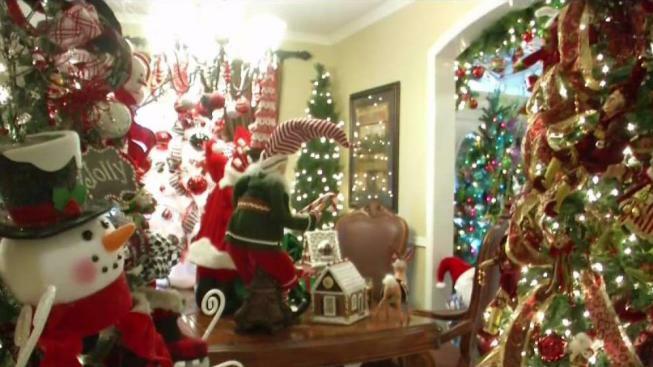 Lamar now sets up nearly two dozen Christmas trees throughout her home, all of them inspired by different themes, from gingerbread to apple pie. She hangs the lights and hand-places the ornaments, one by one, in a yearly tradition that takes her about a week to complete from start to finish. "I have about 30 bins; I'm pretty organized," said Lamar, who admits to being a bit of perfectionist. The result is a colorful, twinkling holiday wonderland, with something to see in every nook. And she doesn't keep the magic all to herself -- she spreads the cheer. Lamar's house was one of a handful of attractions on display for the 11th annual "Christmas in Alpine" home tour put on by the Alpine Women's Club. The fundraiser charges $30 a ticket and uses the proceeds to support local high school seniors with college scholarships. Lamar doesn't have children, which explains how she keeps her decorations looking so perfect, but is happy to put her passion to good use by supporting other kids in her community.